The group of artists that exhibits at the Hive during Artwave has this year offered to raise funds for FoL’s Lewes Urban Arboretum project. They will donate 10% percent of their first night’s takings, and will also be running a raffle with artworks as prizes. 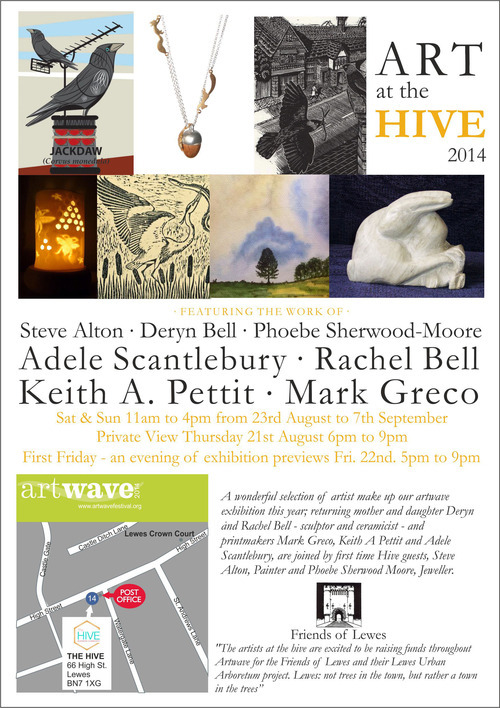 The Hive is on the High St, next to the Post Office, and the artists in the group include Mark Greco, Keith Pettit, Adele Scantlebury, Rachel Bell, Steve Alton, Deryn Bell and Phoebe Sherwood-Moore. Friends of Lewes members are invited to attend the private view on Thursday 21st August, 6-9pm. Please come along if you can, support the exhibition, and perhaps buy some art. The more the merrier!